Power Station vs Solar Generator? The first thing we must get out of the way when it comes to portable solar generators and power stations is the name and how it’s a little bit misleading. Each product we’re looking at today can’t generate energy on their own as a gas generator can. The ways you charge these portable battery packs are through AC outlets, cars, and solar panels. Not all companies advertise them as solar generators, but if you see one and it doesn’t have a way to generate energy without any additional accessory, it’s misleading. I will be calling them portable power stations in this article because that is what most of them are. Portable power stations is a product category that has had incredible growth in the past couple of years. A big reason is portability and power. Lead acid batteries are heavy, bulky, easy to damage and did I say heavy? The new and more portable lightweight option is lithium, and that’s what you’ll find in newer power stations. Lithium is not only lighter, but safer to discharge under 50%, unlike a lot of lead-acid batteries. But a battery on its own won’t satisfy most, as it’s the inverter that lets us use that battery power no matter where we are. It turns the 12V DC power into 120V AC power, and with it comes standard household outlets. Charge your laptop, plug your little fridge in, your instant pot, and even your microwave depending on the max wattage of the inverter. It’s easy to understand why they’re gaining popularity with preppers, campers, RVers, and travelers. They even work at festivals! Last but not least, the power of the sun. You can plug a solar panel directly into the power station and have it charged up by the evening. Run your CPAP every night while you’re camping, even though you’re far away from shore power. Power stations have a lot of possibilities and you can probably tell that I am excited about them. Today we’re going to take a look at the best portable solar generators, or as we all should call them, portable power stations for camping, RV, or even the prepper at home. We’ll also take a look at how we can plug solar into them to quickly recharge the batteries. 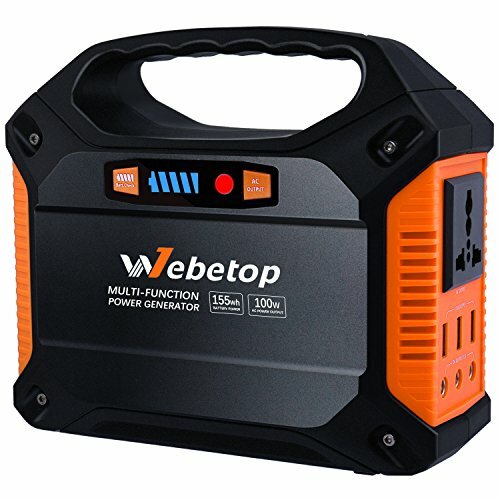 The Webetop 155Wh portable power station is a neat little product with lots of features built into a small package. 155Wh means 42,000mAh so it will charge phones and tablets several times. The AC outlet has a max output of 100W, peaking at 150W. What this means is that it will be powerful enough for most laptops, unless it’s a big gaming laptop. If you want to figure out how long it can charge your laptop you must know the Watts it requires. My MacBook consumes 60 watts per hour so the calculation I would do is 155/60*0.85=2.19. I would be able to charge my laptop for 2.19 hours. I multiply by 0.85 since inverters that turn DC into AC aren’t 100% efficient, but around 85% efficiency is common. Underneath the AC outlet, you will find three USB-A ports, rated at 5V/2.1 so your phone would charge relatively fast. There are also three 12V DC Outputs rated at 12V/15A max total. A DC to cigarette plug adapter is included so you can use 12V accessories that you would usually plug into your car cigarette plug. On the other side of the output ports, there is a LED flashlight that can be useful at night if you’re camping. The battery lasts up to 125 hours while just running the LED. Underneath it is the DC input rated at 13~24V up to 2.1A max. There is also a fan that will keep the batteries and inverter cool during use. Along the side there is a button to turn on and off the AC outlet, and a battery check button that lights up a battery indicator to let you know how charged the battery is. On top there is a big handle which is really convenient for transporting the power station. You can charge the Webetop 155Wh with solar panels, I recommend a portable folding one like the SUAOKI 60W Portable Sunpower Mono-crystalline Solar Panel. I have written an article about portable solar panels and what I recommend that you can find here, note that it must have a DC output to be able to directly plug into the Webetop power station. Charging it from an outlet at home or cigarette plug with the included car adapter takes up to 8 hours and how long it takes with the solar panel depends on the wattage. A 30 watt solar panel would take a little bit more than five hours in the sun to generate enough power to fill the battery. At 3.48 lbs, the Webetop power station is a very portable little station that would make a great camper buddy. As long as you have a way to charge it up, like with the solar panel I recommended above, and don’t have appliances that require more than 100 watts, it’s a great option. With 155 watt-hours, you will be able to charge your phone, tablet, speaker etc. several times before having to plug it in. Included in the box are a wall adapter, a car charger, a DC to cigarette plug adapter, and a user manual. I have talked about Jackery earlier in my post about the best portable power banks so it’s no surprise that they make a portable power station. 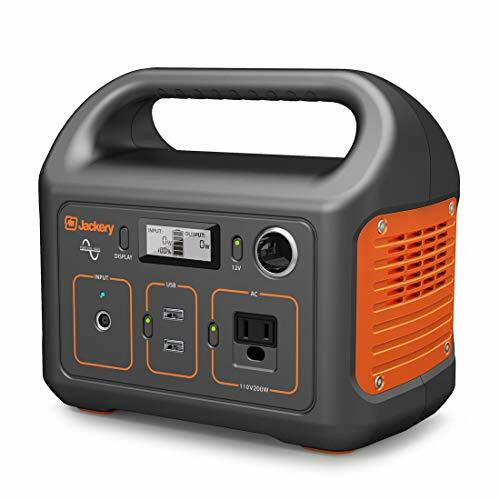 The Jackery Explorer 240 is a 240 watt hour power station that has a couple of features that I really like. One feature I like to have on power stations is an LCD screen that tells you the battery percentage, input and output watts. Having a percentage on a screen makes it easy to follow what’s going in and out of the batteries, and it’s more fun than having five battery indicator bars to go off of since it’s more accurate. It’s also great to have when you’re charging the power station with a solar panel since the screen will tell you exactly how many watts it’s generating and with that information you can angle the solar panel to find the perfect angle for that hour of the day. Another thing I like is the built-in handle. Jackery has put a huge handle on this to easily be able to bring it with you. It’s small enough to bring in and out of a tent with ease and having a handle on top like this is very convenient. On the front you will find an AC output rated for up to 200W, two USB-A ports rated at 5V/2.4A, a 12V cigarette plug output, and a DC input. Each output has its own little button to turn it on and off which is preferable so the AC outlet stays off if you only want to use the USB ports, for example. The sides have holes for the fan inside so the inverter and batteries can be cooled as needed and not risk overheating. So what can you power with 240 watt hours and for how long? Well, let’s take the example with my MacBook again. It uses 60 watts an hour. The inverter in the Jackery Explorer 240 is 85% efficient which is average but not bad at all for being in a small power station like this. So we’ll find the answer by taking 240/60*0.85=3.4. That tells us that I will be able to charge my MacBook for 3.4 hours before the power station is at 0%. That is not bad at all considering the power station only weighs 6.6 pounds. Something Jackery could’ve done better is put in a higher rated DC input. As of now, the input can only take 40W at most. With a 240Wh that means it will take at least six hours to fully charge it no matter the way you charge it, be it through the wall, solar or car. In the box, you will find a 9.5 feet AC adapter, and a 3.3 feet car charger. Jackery sells a 50W solar panel that goes with the Explorer 240, click here to see that solar panel on Amazon. Aeiusny makes this popular power station that has tons of features in a small package. With 288 watt hours and a 500W inverter, it’s a station that will be the best option for a lot of people. Having a 500W inverter means that you can run a laptop, a big tv, and charge your USB devices all at the same time. What makes it even easier to use with several appliances at once are all the outputs it has to offer. You get not only one, but three AC outputs. These outlets are easily turned on and off with a switch. On the opposite side of the AC outlets, there are four USB ports and four DC outputs. Two USB ports are rated at 5V/1A and two 5V/2.1A. If the at least 10W coming out of the faster USB ports aren’t enough for you, you can always plug your higher wattage wall adapter into one of the AC outlets. So what can we power with 288 watt hours? Back to my MacBook example that draws 60W. We’ll take 288/60*0.85=4.08 hours of MacBook Charging. I multiply with 0.85 to include loss of power from the inverter when converting DC into AC. Three indicators below the DC outputs will let you know if the power is on, if the station is charging through AC, and if you’re generating energy through solar. There is also a LED light built-in with its own switch, great to have when you’re camping. One of my favorite features on the Aeiusny power station is the battery indicator. It shows a percentage based on how much battery is left. I really like this solution for a small power station, as an independent LCD screen might draw slightly more power than an easy power display with just a percentage. A small detail, but they matter. Charging with solar is easy to do, as long as you have a solar panel rated at 13V-21V, 20W-100W. All you need except the solar panel is a Aeiusny Solar Panel Cable MC4 Connector. The voltage and watt support mean that you could even buy a solar panel like the Renogy Foldable Solar Suitcase Kit 100W Mono Without Charge Controller to put outside your tent, RV or vehicle while camping. You’ll be able to charge the power station in less than five hours in the sun as long as the panel generates at least 60 watts. No matter what solar panel you buy, make sure it doesn’t have a charge controller as the Aeiusny has one built in. Included with the kit is an AC cable to charge it through regular outlets, a solar input charging connector for DC cable connections, and a car charger cable. There are several reasons why I recommend the Aeiusny and why it’s one of my top picks. A relatively large battery with a big inverter for a power station, a built-in light, battery percentage, three AC outlets, four USB, four DC ports, and fast solar charging capabilities. It’s impressive what Aeiusny has been able to fit in this product weighing only 7 lbs. It has CE, ROHS, and FCC certification so it’s a safe option as well. Anker makes the best-looking power station in today’s comparison, and I like the name as well: Powerhouse. The Powerhouse is a portable power station with 434 watt hours of capacity. I have seen it advertised as both 400 and 434 watt hours, but according to Anker’s website, 434 is the correct number. A big screen will show battery percentage, input/output watts, and what output ports are active. On the front there is one AC outlet, four USB ports, a 12V cigarette plug output, and a DC input. Each output can be turned on and off with the push of a button, which lights up to let you know whether it’s active or not. Anker advertises the four USB ports as smart fast-charging ports, but they’re only rated at 5V/1.5A so it won’t be very fast charging for most phones and tablets. My 60W MacBook would be able to charge for 6.14 hours based on my calculation, 434/60*0.85. The 0.85 is to count in loss of power after the inverter has converted DC to AC. I have to give Anker cred for the big handle that folds down. It keeps the power station looking neat while having the functionality. When you’re carrying around 9 pounds, a handle makes it very convenient and instantly creates a better user experience. The Anker Powerhouse can be charged with the included 10 feet AC adapter that is rated at 16.8V, 3A. It takes up to 10.5 hours to recharge with that cord. You have the option to recharge with solar as the Powerhouse has a DC input. This makes it capable with solar panels like the ALLPOWERS 80W Foldable Solar Panel. The DC input is rated at 16-17V/6A, telling us that it can take up to 100W of solar input. If we assume that an 80W panel generates at least 50W an hour, it would take almost nine hours of good sun to charge the Powerhouse from empty to full. 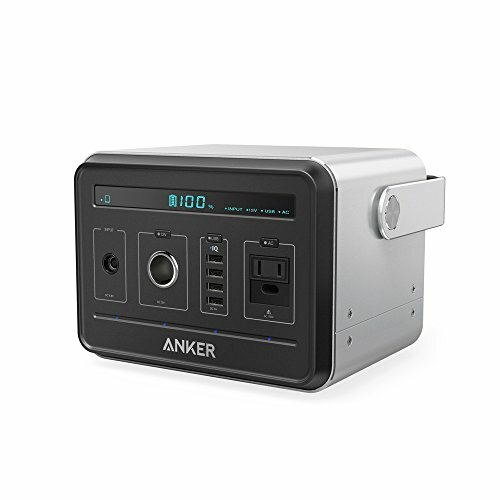 The Anker Powerhouse is a powerful power station that would make a great camping buddy for most people. It has a big battery, a big handle, a cigarette plug, a big screen, and supports solar charging up to 100W. With faster USB ports, and another AC outlet, it might’ve competed more with the Aeiusny, but it’s still a very capable power station. The biggest con for me is the inverter that only supports up to 120W of output. Keep that in mind if you’re planning on charging a laptop with it. Next up is a power station with a design that might lead you to believe it’s a Goal Zero product until you read the brand name on front and top, it’s actually from Suaoki. It’s pretty clear where Suaoki got their inspiration with the design. Anyway, onto the features. The G500 has a 500 watt hours of capacity and a 300W pure sine wave inverter to run your electronics. On the front you will find two AC outlets, two USB-A ports and one Type-C, two DC outputs, and a cigarette plug. I like that they put a USB Type-C in here since newer laptops and phones charges through this latest USB technology. The Type-C port is rated at 12V/3A, meaning that it can deliver up to 36 watts of power. Check the power brick of your notebook to know if that’s enough to keep your laptop charged during use. It’s definitely enough to run the Nintendo Switch as long as you’re not docked up through HDMI. The two USB-A ports are rated at 12/3A (max 18W) as well and will let you quickly charge your phone and tablet. Having a 300W inverter with 600W peak is great for camping. It will let you run a smaller tv, laptop and charge your phone, all at once. With two AC outlets, that becomes even more possible. It would be able to charge my 60W MacBook for just about 7 hours, based on 500/60*0.85. Where 0.85 is for the inverter efficiency (85% efficiency is average). A screen next to the outlets will tell you how many watts you’re using and inputting. I always appreciate products with this kind of information directly on the unit, especially since I often rely on solar power. Knowing how many watts your panels are generating makes it easy to plan and calculate how long it’s going to take to fully charge your batteries. A big handle folds up on top to make it easier to move the 22 pounds power station. Included in the box is an AC adapter, a car charger cable, and an MC4 solar charging cable. I have to applaud Suaoki for including an MC4 solar charging cable. It plugs into the power pole input on the power station and then lets you plug up to 150W worth of solar into the unit. I recommend a portable one like the Renogy Foldable Solar Suitcase Kit 100W. A panel like this can often generate between 50-70 watts of solar, so it would take about 8 hours of sun to fully charge the Suaoki G500. The built-in solar charge controller in the G500 is MPPT which has better efficiency than PWM charge controllers usually found in power stations, so it should be able to generate about 70-80 watts in good sun. If solar isn’t for you, you can always charge it with the included AC adapter or in the car. Charging it through the wall outlet would take up to 10 hours from 0-100%. The Suaoki G500 not only looks a lot like a Goal Zero product but does a lot of things just as good, even better in some aspects. I really like that Suaoki has put a USB Type-C on the unit, whereas Goal Zero is only doing this on their more expensive units. G500 can take up to 150W of solar, making it a very capable power station even for RV full-timers. Two AC outlets, two fast USB-A ports, cigarette plug, and a nice screen to go with it that gives you the information you need to know what’s going on inside the unit. 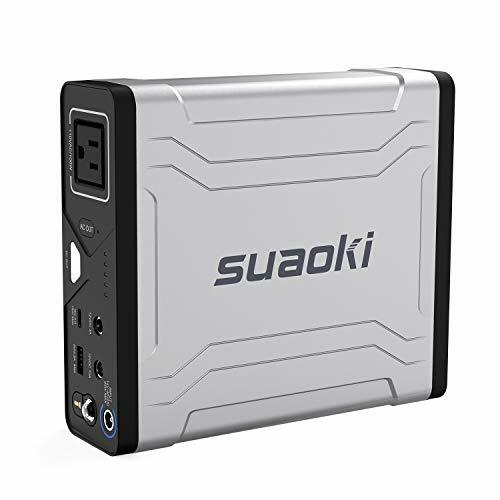 If you’re not planning on using any appliances over 300W and want a bigger battery than in the Aeiusny, the Suaoki G500 is a very good strong choice that won’t disappoint. Paired with a solar panel it can be the only power source you’ll need in the wild. Last but not least is the Goal Zero Yeti 1000 Lithium. Goal Zero is a popular brand when it comes to power stations, and it’s easy to understand why when you take a look at all the features. 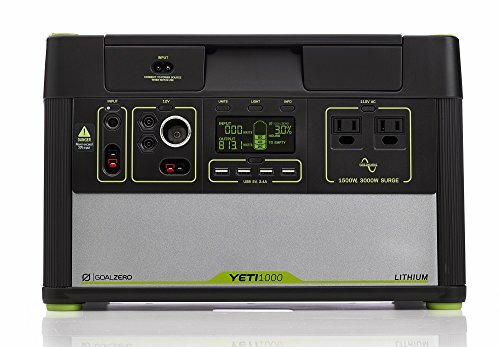 The Yeti 1000 Lithium comes with 1045 watt hour capacity and can power up to 7 devices at once. What’s especially impressive is the huge inverter that supports up to 1500W, 3000W peak watts. With an inverter that big, you could actually run a microwave, a smaller AC unit, and even plug your RV directly into it with a 15A (regular household outlet) to 30A/50A adapter. It won’t be able to run your RV AC though. So what could we do with 1045 watt hours? Well, a 900W microwave would run for about an hour. My 60W MacBook would run for almost 15 hours based on 1045/60*0.85. I multiply with 0.85 because 85% is the average efficiency for an inverter that converts DC into AC. On the front, you’ll find a screen that will tell you lots of information about what’s going on. Input watts, outputs watts, amps, battery voltage, and battery percentage. Some Goal Zero products also have the feature of telling you how many hours it’s going to run the appliance plugged in based on how many watts it’s drawing, or how many hours are left until the battery is fully charged based on the input wattage. A neat feature that can be helpful both when charging and discharging. Next to the screen, there are two AC outlets rated at 1500W max, four USB-A ports rated at 5V/2.4A, two DC outputs, one cigarette plug, and a power pole output. There’s also an input for the AC cable, and two ways to charge with solar, power pole and 8mm. We have three ways to charge the Yeti 1000: AC wall outlet, solar, and the car. Unfortunately, a car charger is not included and requires a special adapter that was just released by Goal Zero, you can find that adapter by clicking here. The AC charging cable is included and easily plugs into the Yeti. For solar, there is a PWM charge controller built-in with two inputs. 8mm and power pole. The charge controller can handle up to 360 watts. As we know from before, PWM is not as efficient as MPPT charge controllers, and Goal Zero’s solution to this is to sell a module that you install on the Yeti 1000. It’s called the Goal Zero Yeti Lithium MPPT Solar Charging Optimization Module. Goal Zero advertises up to 40% faster charge by using this module. I have a Yeti 1000 with an MPPT module and will be doing my own tests with both solar panels and the wall adapter, that article will be out soon. Goal Zero sells solar panels with 8mm connections that directly plug into the Yeti 1000. They have a 100W briefcase version that you can find by clicking here. They also have a 200W briefcase version that you can find by clicking here. To charge the Yeti with a solar panel that has MC4 connections, you’ll need an adapter like this JoinWin MFG MC4 to Anderson Power Pole Adapter Connector. I use a Renogy Foldable Solar Suitcase Kit 100W to charge the Yeti 1000. Since the Yeti 1000 has a built-in PWM charge controller, make sure you get a solar panel without one a charge controller already installed. The Yeti 1000 is a big battery with a big inverter. A 1500W/3000W inverter lets you run your RV on this which is a cool feature on its own. Plug some solar panels into it and you can use this as your only electricity source. It has the best screen out of all power stations we’ve looked at today, with the most relevant information. The information makes it easy to follow how many hours you can use your appliances and how many watts they’re using. I recommend the Yeti 1000 for campers, even full-time RVers, that want a plug-and-play system with enough juice to run the microwave or an electric pressure cooker. Basically all the appliances in your RV except the air conditioner. With 100-300 watts of solar, you can easily keep it charged. Note that there are both smaller and bigger versions than the Yeti 1000. There are the Yeti 150, Yeti 400, Yeti 1400, and Yeti 3000. If it doesn’t have Lithium in its name it’s not a lithium battery but a lead-acid battery. It can be hard to know which power station is the best for you so I recommend going through the what to consider if you have no idea what you might need. My recommendations are based on which power stations I believe have the best features. 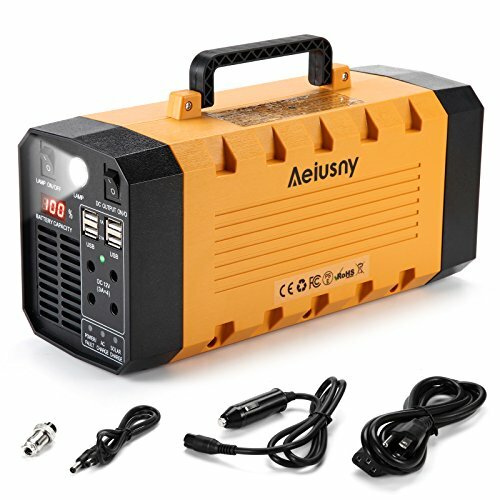 Good Option: Aeiusny Generator Portable Power UPS 288Wh – The Aeiusny is a very powerful power station with a relatively big inverter that lets you run several appliances at once. Three AC ports, battery percentage display, four USB ports, built-in light and an easy to use solar interface. It has everything you need for camping. My Choice: Goal Zero Yeti 1000 Lithium – The Yeti 1000 Lithium is my favorite in today’s comparison. The biggest reason is the huge inverter that lets me plug the station directly into my RV so I can use my outlets. It supports lots of solar, has a cigarette plug, four USB ports, and a great screen that will give you all the information you might need when you’re camping. It’s the best plug-and-play system in my eyes and I truly recommend it for camping or prepper purposes. Watt Hours/Capacity – Considering how much capacity you need is the first thing to do. In the frequently asked questions on my post about the best portable solar panels, I have gone through how you can calculate how many watts and amps you use. An easy way of figuring out how much capacity you need is to buy a Poniie PN2000 Plug-in Kilowatt Electricity Usage Monitor. This lets you plug your appliances into it and tell you how many watts each appliance is using. So if you plug your laptop in and it reads 50 watts, that’s how many watt hours it will be using every hour it’s plugged into the power station. If a power station then is 300Wh, we’ll do 300/50=6, and then we know that the battery will run our laptop for 6 hours at most. Inverter Size – The inverter is what allows us to use AC outlets on the power station. It converts the DC power coming out of the batteries to AC. When I am talking about the size of the inverter, I am not talking physically, but how many watts it can handle at once. To know how big of an inverter you need, you must know how much your appliances draw. For example, the microwave in my RV is rated at 900W. So I am going to need an inverter rated at around 900 at least, preferrably more. My gaming laptop charger is rated at 240W, so a power station with a 120W inverter won’t be enough. If you don’t know how many watts your appliances need, you can use a Poniie PN2000 Plug-in Kilowatt Electricity Usage Monitor. Weight – Depending on what kind of camping you do, the weight will become more or less important. If you’re in an RV and plan on leaving the power station in one place, the capacity and inverter size will matter more. If you want a power station to bring with you hiking, the weight will be extremely important. Solar Capabilites – To me, charging with solar is really cool. I can’t get over how great it is to be able to be out in the woods, far away from any shore power, and be able to keep all my devices and power station charged up. Some power stations can’t take very high inputs though, so charging with solar becomes extremely inefficient and frustrating. Products like Goal Zero Yeti’s can take a lot of solar input at once. If you’re planning on charging with solar power, make sure you check how many watts it can handle, and that the solar panel you buy has the right voltage and amps supported. Outlets – If you’re only planning on charging USB devices, well maybe you won’t need an AC outlet. Then I recommend reading my article about the best portable power banks, they’re more portable and lightweight. The difference in the number of outlets in the power stations we’ve looked at today aren’t huge, but some have one or two more USB ports or one additional AC outlet. Think about what kind of appliances you will be plugging into your power station and choose the one that fits the best. How long will it take to charge my power station with solar? When plugging solar into your power station, you have to be aware of what limits it has. There is often a voltage limit and an amp limit. These should be easy to find in the manual or the specifications. Now, how long will it take to charge from 0 to 100%? First we need to know how big the battery is in the power station, let’s say it’s 500Wh. If we get a solar panel rated at 100W, we should expect to get about 60-70W out of it in good sun. Solar panels aren’t 100% efficient, and it also matters what kind of charge controller is in the power station. But we’ll say 60W average. What we need to do then is take 500/60 which equals 8.33. That’s how long it takes to charge our battery from empty to full if we have good sun for that long. Realistically speaking, you most likely won’t get 8.33 hours of good sun in a day, so it might take two days of pretty good sun to reach a full charge. If we had two 100W panels, and an MPPT charge controller, maybe we would get 70W on average from each panel, 140W per hour. So we’ll do our calculation again, 500/140=3.57 hours. It’s realistic that we will get about five hours of good sun, so that would take our battery from 0 to 100% in just a couple of hours. How long can I use a specific appliance? To see how long we can use a specific device we need to know how many watts it uses. That is something that is easy to check with a Poniie PN2000 Plug-in Kilowatt Electricity Usage Monitor. Plug your appliance into this and it will tell you exactly how many watts the device is drawing. I have used my 60W MacBook as an example throughout the whole post, so now let’s see how long a battery would last with my 12W phone charger. If I have a power station like the SUAOKI G500 which has a 500Wh hour battery, I can easily do the calculation by taking 500/12=41.66. So in a perfect world, I could charge my phone for almost 42 hours. But since my phone charger is an AC appliance, we have to count in the efficiency of the inverter, which averages 85%. We’ll take that 41.66 and multiply it with 0.85: 41.66*0.85=35.41 hours. This is a more realistic number. The best thing to do is to make a list of all the devices you plan on using with the power station. If you’re going away for three days and plan on bringing your laptop, phone and tablet, all of them need to be on the list. Let’s say that we’ll use our laptop for two hours, our phone needs to be charged every day for two hours, and the tablet needs to be charged once. If you don’t know how many watts your device use, you can use a Poniie PN2000 Plug-in Kilowatt Electricity Usage Monitor. 176*1.15 (inverter inefficiency) = 202.4 watt hours is what I will need. This is an easy way to figure out how much capacity you need. The outlets you have in your home deliver AC power, it stands for alternating current and is 120 volts. The power in most RV batteries is DC, direct current, 12 volt. An inverter turns DC power into AC power and lets us use outlets, even though we’re far from the power grid. Inverters aren’t 100% efficient, and while converting DC to AC it loses some power, which is why I often multiply by 0.85 at the end of a calculation when it comes to inverters. That way I assume that the inverter loses 15% of the power and ends up being 85% efficient. It’s smart to overestimate how much power your appliances and devices use, instead of the opposite, so you won’t be disappointed when your power station won’t charge your laptop as many times as you thought it would because you assumed the inverter would be 100% efficient. Hi Jesse, can you help me in which power station would be best for my use. I’m thinking to get a small t.v. Between 17-20ft max. I want to be able to have the receipt on while driving, I’m sure the batteries would do. But at night i might want the a/c on as well for few hours, since I’m thinking on summer trips. And if emergency preparedness. Hello Victoria, thanks for stopping by. Air conditioners use a lot of power and will unfortunately not run on any portable power station. Most RVs come with a 13,500 BTU A/C that use around 2750 watts to start up, and about 1250 watts on average to run. This means that even if you would get the biggest Goal Zero power station (https://amzn.to/2U61H3H) it would only run an A/C for about 2.5 hours before having to recharge, which makes it inconvenient. For running a TV and smaller devices I still recommend the Aeiusny (https://amzn.to/2WzRjhs). A 50 watt TV would run for about five hours and the unit can then be recharged in your vehicle while driving.